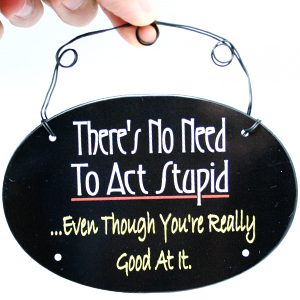 No Need to Act Stupid even though you're really good at it sounds like something we hear a lot over here at GagGifts.com. But of course, we ARE really good at it and that's the way it should be. This little Magnet is a ton of fun and the perfect accent piece for any home, car, or workroom. It has innocent appeal with a bit of sharp bite. Just like you, this Magnet loves to tease its victims. Approximately 6" wide.